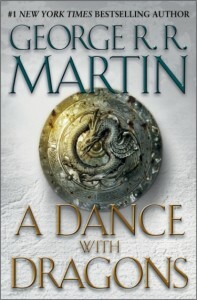 On July 12th, A Dance With Dragons by George R. R. Martin landed in bookstores with a thud. After many years of waiting, fans of Martin’s Song of Ice and Fire fantasy series were eager to read the latest volume. Have you not read Martin’s Song of Ice and Fire because you think that you don’t like fantasy? If so, you’re missing one of the best series in popular fiction in the last 30-40 years. Certainly, there are fantasy elements to these stories – dragons, savage sword fights, and a richly detailed world – but these are simply fabulous reads. Some reviewers have compared the series to the Sopranos meets the Middle Ages. Others have heralded Martin as the American J.R.R Tolkein. George R. R. Martin has earned international acclaim for his monumental cycle of epic fantasy. Now the #1 New York Times bestselling author delivers the fifth book in his spellbinding landmark series–as both familiar faces and surprising new forces vie for a foothold in a fragmented empire.